Maybe it's because my pregnant body is preventing me from wearing outfits I really want to wear (pregnancy is beautiful but I'm just being honest here) - thus making those outfits all the more appealing - but I have been spending way too much time lying in bed in the middle of the night pinning inspiring looks to my Pinterest fashion board. I have made the effort to look at least somewhat put together in my daily life, I really have, but I'm once again finding myself in the tunic and legging uniform on more occasions than I care to admit. The looks you see above are some of my recent favorite fashion finds, each of which is giving me some serious style envy. On a positive note, I can kinda sorta create maternity outfits out of a few of them, so the inspiration isn't totally lost. And truth be told, I'm sure I'll be a little sad when this pregnancy is over, so I'm going to do my best to embrace the current sloppiness and ill-fitting ensembles, and tuck these looks away in my mind until January when I'll be able to wear them again. For now, I hope they bring you some style inspiration as well. The maxi dress is so beautiful :) Pinterest is addictive, isn't it! 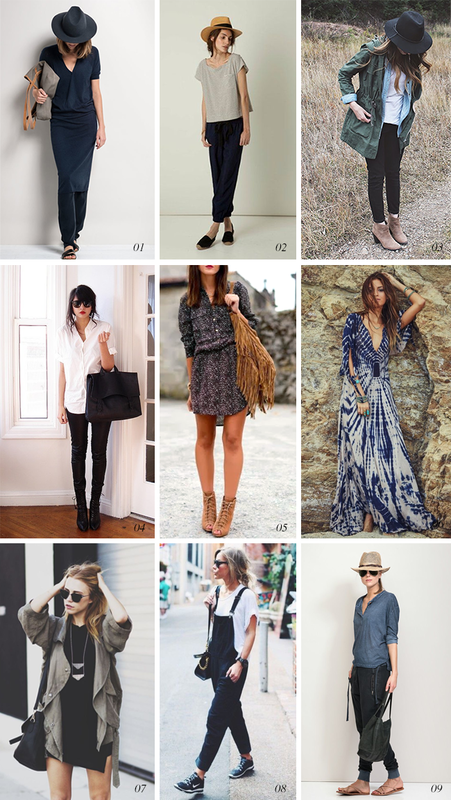 Pinterest fashion boards are a little bit like going down a rabbit hole, I think - once you start, it's very hard to stop, particularly as they make it feel so easy, like you could wear all of these outfits if only (insert anything you want here; you and the right pieces, you had a different body, you lived in a different city.) I'm sure during pregnancy, which I have always imagined to be a very sartorially challenging time, the temptation is only greater! I love all 9 of these but the first one to catch my eye was the maxi blue and white dress! Such a perfect summer dress! Thanks for your comments everyone! Glad you like these picks too.